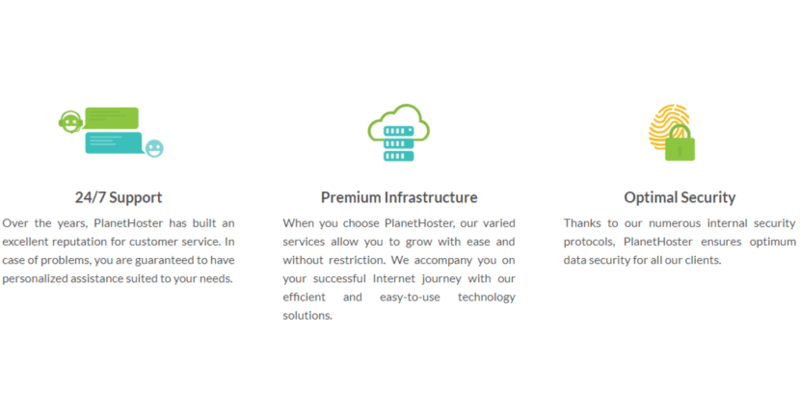 Planet Hoster Review 2019: Is Planet Hoster a Good Hosting? PlanetHoster is a large multinational hosting agency that owns and operates their own data centers and hosting infrastructure. The company hosts over 100,000 websites on their servers, located throughout their facilities in France and Canada. PlanetHoster was established in 2007 and have grown rapidly since then. This is largely thanks to their high quality hosting services, which they offer to customers throughout North America and Europe. They currently have over 60,000 customers and host more than 100,000 websites. Their data centers are in Montreal, Canada and Paris, France. In addition to their shared hosting services, they offer domain name registration, managed cloud servers, SSL certificates, and other general web services. PlanetHoster is popular because of their shared hosting platform, so I’ll start there. Their all-in-one package includes an in-house World control panel and cPanel for easy account management, and all shared hosting users are hosted on a powerful and scalable cloud infrastructure — ensuring the utmost reliability. As you can tell, PlanetHoster seems to have spared no expense in making this all-in-one package as feature-packed as possible. Not only do they include unlimited resources, but they have rarely-found perks like IPextension (which gives you up to 1000 additional IP addresses), twice-daily backups to their second data center, a free website builder, and a smart CMS platform that supports the most popular installations such as WordPress, Joomla!, Drupal, Magento, and Moodle. Essentially, not only is this package extremely convenient and beginner-friendly, but it also caters to developers who require more advanced features. You can also opt for their VIP service at an additional monthly fee. This includes all the features of the World package, but also gives you a free private WHOIS for all your domains and premium VPN connections from multiple locations. PlanetHoster’s single shared hosting plan is priced at the higher end of today’s market. But given that it’s an all-inclusive deal with unlimited bandwidth, storage, and even websites hosted per account, it’s actually an amazing deal. The only caveat is that if you do decide to host, say, 50 domains on your shared hosting account but opt to remain at the default CPU and RAM allocations, you may find that your websites are running a tad slower than you’d like. This is because you’ll be capped at the maximum of eight CPUs, 24GB RAM, and 24MB/s I/O per shared hosting account — unless you decide to scale up your package. If you choose to scale up your package, you can do so from the outset during the checkout process, or go to your user-friendly World control panel to scale up your resources at any time. The more CPU, RAM, and Disk I/O you go for, the more discounted the increments. Of course, you also get a discount for selecting a longer contract term. PlanetHoster also has a free web hosting plan dubbed World Lite. This gives you quick access to the world of website building with features like a website builder, PHP7, MySQL databases, 750MB storage, and more. They also have a 14-day money back guarantee with their World shared hosting plan. Their tech support is very professional and easy to communicate with, especially when you’re under stress. You can reach out for support using the live chat during their working hours. Outside of office hours, your messages will be directed to a support ticket service with a response time of under 15 minutes, so you’re covered either way. PlanetHoster offers support through a phone line as well. One thing I did find odd was that I couldn’t find any knowledge base or FAQ, however. Overall, PlanetHoster is an amazing choice for quality shared cloud hosting at affordable rates. You’ll be happy with the level of service you get, their support is nice, and they have a good reputation for reliability and quality. Wondering how Planet Hoster stacks up against other Web Hosting companies? Enter any other Web Hosting company and we will give you a side-by-side comparison.